This chapter has interesting insights into the parable of the Prodigal Son or some say the Waiting Father. JP does a good job of showing that this is all about the waiting father’s prodigal lavish love and grace to both of his sons. The first son was accepted even though his motive for returning home was suspect with self-interest, and his mentality is one of works – “Let me try to earn my keep by working for you like one of your hired servants”. The second son, also had that same works mentality: “I have slaved for you all these years and you never gave me what I deserved, but this son who never deserved anything, has a barbecued fatted calf!” Both sons showed the flawed but common approach to Christian life of many Christians. Joseph Prince himself personally does confess and admit his wrong to God (310) but it is done as one already forgiven, as one secure and deeply loved: “Do I say “sorry” to God and confess my sins when I have fallen short and failed? Of course I do. But I do it not to be forgiven because I know that I am already forgiven through Jesus’ finished work. The confession is out of the overflow of my heart because I have experienced his goodness and grace and because I know that as His son, I am forever righteous through Jesus’ blood. It springs from being righteousness-conscious, not sin-conscious; from being forgiveness-conscious, not judgement-conscious. There is a massive difference.” An earlier quote (308,309) shows the belief he finds harmful: “Some people think that fellowship with God can only be restored when you are perfectly contrite and have perfectly confessed all your sins. They think that you must apologize to God before He can be appeased. Please understand that I have nothing against saying “sorry” to God or confessing our sins. All I am saying is that we are not as important as we make ourselves out to be. The father was the initiator. Before the son even had thoughts of returning home, the father had already missed him, was already looking out for him, and had already forgiven him. Before the son could utter a single word of his rehearsed apology, the gather had already run to him, embraced him, and welcomed him home.” I thought it good to quote extensively here, as there has been some controversy and confusion about JP’s statements about confessing sins that are often not accurate reflections of his understanding. Hope this clarifies and settles some dust from your eyes. The focus in this chapter is our propensity to try to earn the Lord’s love and favour. JP demonstrates that both sons had that mentality. Believers therefore need to come to a place of believing and receiving God’s love and let it transform them. All his love and spiritual resources and blessings are already ours not because of our perfect performance but His perfect finished work. And when we learn to receive God’s love, we will be empowered to live free from the pig sty life that the prodigal son would never think of going back to after experiencing the love of the father. The best way to sum up this last chapter is to quote a “simple but critical truth”, one that you should memorize “even if you forget everything else you have read in this book”. Here it goes: “As a child of God, no matter what happens in your life, your Father in heaven loves you dearly and nothing you do can ever change that.” Believing this will free you from the performance trap; give you power to overcome mistakes, failures and sins in your life; triumph over temptation; and make you unshakeable. The central idea in this part is all about having hope: a confident expectation of good from God because He is gracious. It’s about what is hope, why it is important, how to have it, and bible examples of this truth in action. Joseph Prince used the famous battle that Jehoshaphat fought against enemies that formed an unholy alliance against God’s people (2 Chronicles 20). It demonstrated how hope comes, and how it works magic in impossible situations that God’s people finds themselves in. Inspiring chapter. The story of Jabez’s prayer and God’s answer to him (1 Chronicles 4:9) was the basis of encouraging us to unashamedly ask big when we approach God in prayer. He tells the inspiring story of Olivia Lum, the entrepreneur who founded Hyflux, Singapore’s first water management company to be listed in the SGX. 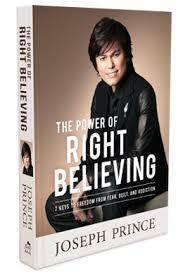 Joseph Prince reminds us of the thesis of this book. There is power in right believing. And the secret to right believing is right listening. He demonstrates this principle by showing how listening to the stories of Jesus healing power raised the faith of the woman who had been bleeding for 12 years (Mark 5). Well, I am surprised that I have actually come to this point. This is the second last part of the book. Most books remain unfinished on my book shelf. I am easily distracted when it comes to ideas. I move from one idea and interest to another quickly. You could say it was my earlier pledge to readers that has brought me to this point. Now I can see the finish line. The insights in these chapters does not grab you like gems in the earlier chapters. But the stories are inspiring. I love the Olivia Lum story. Wonderful stuff. This part is an easy lap. It energises, it inspires. It is not rocket science. Hope is strengthened when we keep our eyes on Jesus and his love for us. God wants to bless us and we can have a confident expectation of good because of His unchanging love. Part 5 shows how a reader can move from an undesirable position of self-occupation to the desirable one of Christ-occupation. This is a continuation of the whole theme of the renewal of our minds by right believing. Part 5 shows the goal and why it is important and how it can be done. 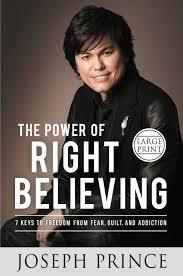 Joseph Prince emphatically states the need to move from self-occupation to Christ-occupation. Too many are self-occupied and as a result suffer from the consequences. They are overly concerned about what others think or say about them. They suffer from an inferiority or a superiority complex. They are often insecure and dwell on negative thoughts about themselves and others. He used the example of how David slayed Goliath as an example of someone whose trust in God, rather than the bigness of the problem occupied his mind. It set him free from fear and anxiety that plagued the other fighters in the battlefield. In chapter 14 and 15 Prince moved to the practical steps that help us move from self- to Christ-occupation. Chapter 14 shows that the way to do it is to see Jesus in the scriptures. His main text is the story of the two disciples on the road to Emmaus (“warm baths”). The disciples were discouraged and confused over Jesus’ death. The resurrected Lord, unrecognized by them began to show them how Jesus fulfilled the scriptures. He showed them Jesus in the Old Testament. He reproved them for being slow to understand and to believe. This then is one practical thing to do to move to Christ-occupation. Whenever we read scriptures look for God. Do not see more rules and laws to obey. See more of Jesus and his beauty. Then our hearts will have a warm bath just as the two disciples’ hearts burned with holy fire. Joseph Prince uses a story in the life of David. He had fled from Saul who wanted to kill him. He went to Gath and pretended he was mad. They released him and he hid in the caves and Adullam. Prince used Psalms 34 to highlight how David sang and worshipped and prayed and this helped him shift from a self-occupation that discouraged him to a Christ-occupation that inspired him. Prince traced the shift from self to Christ in Psalms 34 thus showing that the act of praising God and praying moves us from self to Christ-occupation. As a whole this was a practical part. It motivates you to co-operate with God bath yourself in scripture and prayer and praise. It reminds me of the traditional “means of grace”: scripture meditation and prayer. In fact the whole of church community life is meant to revolve around the word and the sacrament, both of which point to the finished work of Christ.